Going off rider comments - and final times - from the final test of the preseason, it is tempting to conclude Suzuki is the only of MotoGP's six factories whose aims of improving on those performances from a year ago are not totally reasonable. Gone from the team is Maverick Vi?ales, the series' superstar in waiting, and chief perpetrator of Suzuki losing its factory 'privileges' for 2017. Filling that void was never going to be easy, but team boss Davide Brivio saw enough in Andrea Iannone, a rider with the ability to dazzle and perplex all at once, to deem him worthy of stepping into Vi?ales' exalted shoes. It all began so well. Both Iannone and rookie team-mate Alex Rins complimented the GSX-RR's chassis, known for its renowned handling qualities straight away. Such was Iannone's early pace, it became normal to hear Valentino Rossi - memories of that final fairing-bashing encounter in the final race of '16 still fresh - to mention his name in a list of possible contenders. This was backed up by another strong showing at Sepang in early February, where Iannone placed second overall. 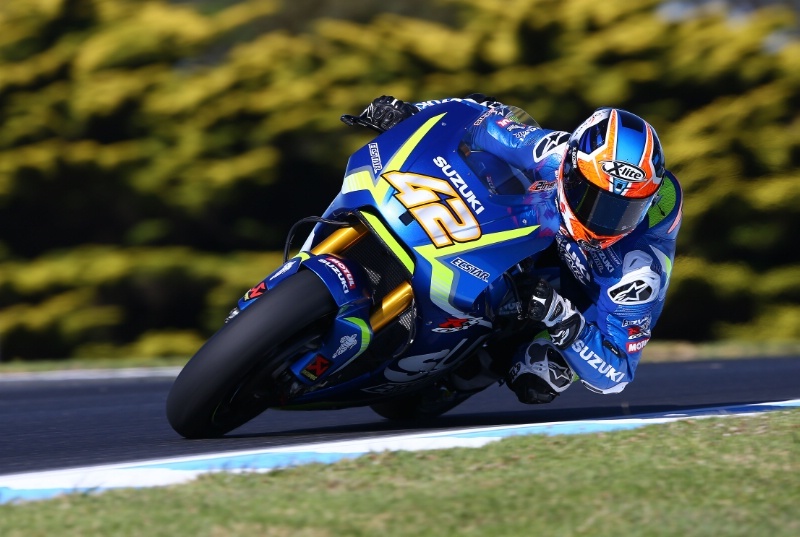 "I can tell you one thing," said Ken Kawauchi, Suzuki's technical manager, in February when asked to compare the style of Suzuki's new arrival to Vi?ales, the man that brought the factory a first dry-weather win in over 15 years. "Iannone's style is more suited to the bike." Subsequent tests have, however, quelled optimism on Iannone's front. Crashes, frustration and minor strops have been a regular feature for the Italian. Only a radical set-up change on the final night in Qatar ensured headlines proclaiming 'rider in trouble' were averted. The bike has undergone no great makeover in the winter months, with factory engineers focussed primarily on engine and chassis tweaks. After all, the GSX-RR was only outside the premier class' top six in one of 2016's dry races. More top end speed is one feature. Adjusting weight distribution and chassis stiffness has been another, while electroncs development is always ongoing. All in all, it remains a solid package, capable of podiums on its day. However, learning how to exact the best of the bike when braking remains a work in progress for both riders. Suzuki did all it could to prevent Vi?ales leaving for Yamaha - and for good reason. Having assessed his talent up close, Brivio was honest when assessing the reasons behind 2016's success. "We have recovered a lot. But, to be honest, another big difference this year has been made by Maverick," he conceded last October. Even in Vi?ales' absence, his presence still casts a shadow over his replacement: namely his specific means of braking with the GSX-RR, a style that Iannone has found difficult to replicate. Understanding how the Suzuki needs to be ridden has been a challenge for Andrea Iannone. pic: Gold&Goose. "I have a very high corner speed," explains the Italian. "Sometimes more than Maverick. But the difference is on the first part of the corner in the braking point. My style is braking, and with the brake I go in at an angle. Compared to Maverick, he braked completely with a straight bike and arrived straight in the middle of the corner. At the last moment he completely put down the bike very fast. It's two different styles." 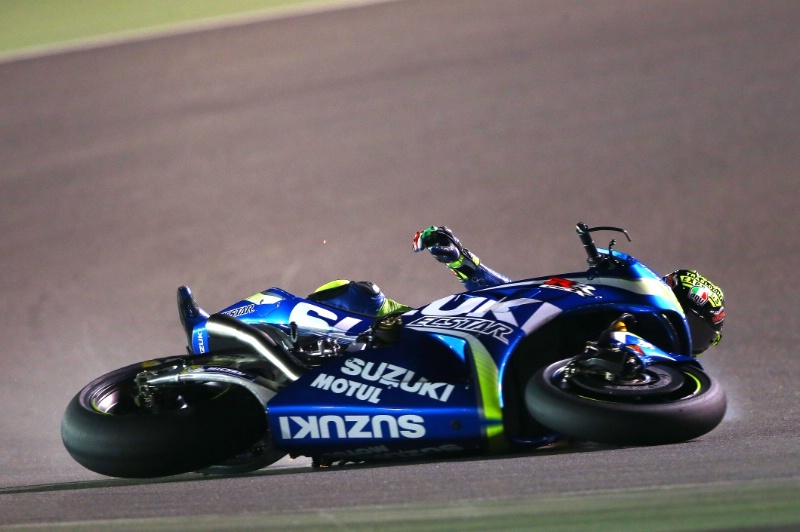 Iannone's comments reflect those given by former Suzuki rider Aleix Espargaro, who regularly encountered similar issues with the GSX-RR's front end. "It's difficult to be consistent because of the front," he says. "You need to ride with the rear, with the throttle. Brake in a straight line and then manage with the throttle, like Maverick did." For Iannone, a man who spent four years aboard a Ducati, adapting his own style hasn't come overnight. As a result of finding the limits when braking at different markers, angles and speeds, Iannone racked up crashes on each of the three days in Qatar. Tellingly, he often wore an expression of exasperation in the garage, while his interactions with the media have become increasingly confrontational. Sporting new tattoos, new hair, and a new nose for the new season, the Italian has unquestionably retained his flair for the unconventional. Meeting somewhere in the middle remains a priority for both rider and team going into the first race weekend of the year, with Suzuki attempting to make its bike more forgiving when a rider applies the brakes later and into the apex of the corner. "We will try on the bike. He will try to work on his style. We will both try to find a good solution, a good compromise," says Brivio. "It's good. I'm happy that Andrea is analysing the situation very honestly, very carefully and that's also the way to fix the problem." It was perplexing to watch a rider of rookie Alex Rins' means notch up just 23 points from a possible 125 as the '16 Moto2 title fight reached its conclusion. Injury undoubtedly played its part. A lack of confidence too. But ex-team boss Sito Pons' words on the rider's focus repeatedly came to mind. Pons was typically forthright when speaking to Spanish journalist Manuel Pecino mid-way through the year. "I told him to forget about Twitter, sunglasses and all this other nonsense. Focus on Zarco!" His talent isn't in doubt. But with regards to preparation, it appeared Alex still had some way to go. From Sepang, Alex Rins has shown he has the speed to succeed at the highest level. pic: Gold&Goose. Rins' end of year quickly went from bad to worse. A crash at Valencia's turn twelve fractured two vertebrae and, crucially, put him out of a private test at Jerez two weeks later. A huge positive then, to see Rins returning to his old self in the new year. "After the problem in November he came back only in 2017 in Sepang with a physical condition that was not yet 100 percent," says Brivio. "He had two months stopped. Then he started very late the training, the preparation. "But we can see that every testing he's improving. He's listening, learning, improving and I feel we're doing a good step. We can see good potential. We can see also from the data he's doing the right thing on a bike, he's doing well. We're happy and also quite confident that when we're able to put everything together [he'll perform]. Let's say the base is good. He does the right thing on the bike. Everything just needs to fit together. But we're very happy with his development." Two new riders there may be, but Suzuki's outfit remains largely intact. Not even the prospect of aiding a near decades' worth of title challenges was enough to convince Vi?ales' 2016 team to follow the rider's suit and up sticks for Yamaha. "It's a very big award for myself, for Suzuki, for our work," said Brivio of Vi?ales' crew's decision to remain with the team into '17. Thus Rins slots into Vi?ales' side of the garage, among a team of technicians who know a thing or two about bringing a rookie up to speed. One only needs to look toward Brivio as reason for this sense of spirit. A re-watching of aftermath of the British Grand Prix and Suzuki's celebrations shows a man who knows a thing or two about stirring up passion. Continuity also breeds this. As such, Marco Rigamonti, Iannone's crew chief, is one of just a few changes at personnel level. Electronics guru Tom O'Kane, formerly crew chief to Aleix Espargaro, has been moved to a new role that oversees the project in its entirety, rather than focusing specifically on one side of the garage. "We slightly re-organised the work of the engineers inside the garage - the same people but dividing the jobs in a different way," says Brivio. "Somebody was working for one rider but now works for both riders, in a central position, doing something for both. Things like that." The need to take risks, and forge what is perhaps an unconventional route, is also key to Suzuki's rapid rise in just two-and-a-bit seasons. Establishing Iannone as lead rider, for example, is the latest of those. "Sure, he is already a strong rider, but coming to our team we gave him - at least at the beginning, until Alex grows up - the responsibility to be the number one rider. Which is a new situation for him. I trust this guy and I think he can do it." The final test of the year in Qatar raised more questions than Suzuki would have liked. But the GSX-RR in Iannone's hands, still remains a podium challenger when conditions favour the brave.